It is believed that nearly 20 million people in this country suffer from neuropathy. As a result, the condition is being extensively studied in an effort to determine its causes. After all, if the causes can be fully identified, there is a better chance of developing a successful way of treating it. In this particular condition, there has been some sort of damage to the way the central nervous system communicates with the rest of the body. As a result, people can experience a range of symptoms, including muscle weakness, paresthesia (pricking sensations), tingling, and numbness. It is also common for particular areas of the body to be more significantly affected, with some even developing allodynia, which is an intense reaction to touch. Symptoms tend to be worst at night, when gland or organ dysfunction, paralysis, muscle wasting, and burning pain can occur. Over time, people may experience organ failure, breathing difficulties, and damage to the urinary tract, sexual organs, and digestive system. The autonomic nerves, which regulate bodily functions, such as the bladder and blood pressure. 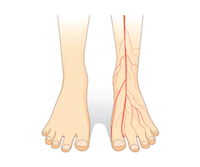 In neuropathy, damage can occur to any or all of those nerves. The symptoms that are experienced, meanwhile, will vary depending on which nerves have been affected, and to what extent. 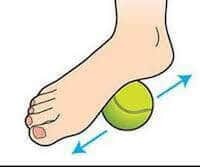 The condition tends to get progressively worse, which is why it is important to seek medical help as soon as you start to experience symptoms that could be related to the condition, such as foot ulcers, loss of balance, and tingling sensations, particularly in the extremities. Metabolic and endocrine disorders, including diabetes. In fact, between 60% and 70% of diabetics also have some damage to their nerves. Small vessel disease, whereby the nerves are unable to get enough oxygen. One example is vasculitis. Cancers, which may enter the nerve fibers or put pressure on them. Lymphoma and multiple myeloma are seen to cause nerve damage quite often. Infections, particularly by viruses like herpes simplex, cytomegalovirus, West Nile virus, Epstein-Barre virus, and varicella zoster virus. 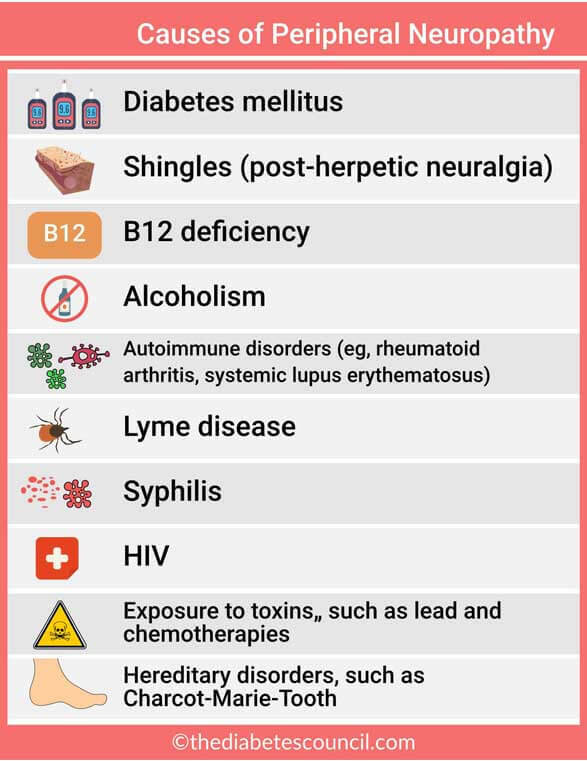 Bacterial diseases, such as leprosy, diphtheria, and Lyme disease can also cause it. HIV/AIDS, which is both an infection and an autoimmune disorder, often causes damage to nerves. Hypothyroidism, which is the result of an underactive thyroid gland. Guillain-Barre syndrome, which is an incredibly rare condition in which the patient is left completely paralyzed within just a few days. Amyloidosis, which is not one disease but rather a group of diseases, characterized by high deposits of amyloid, a type of abnormal protein, in organs and tissues around the body. This disease is very rare, but also very serious. Medication toxicity, particularly in cancer-fighting drugs, HIV drugs, blood pressure medication, and anticonvulsant medication. 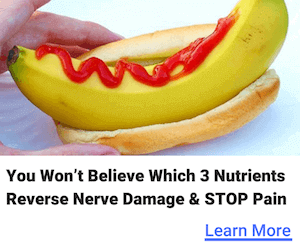 Neuropathy is often resolved after discontinuation of this medication. Medication usually causes nerve damage if it is taken for extended periods of time. This is often seen in nitrofurantoin, metronidazole, and other antibiotics. Industrial or environmental toxins, such as arsenic, mercury, and lead, including certain solvents and insecticides. Heavy alcohol consumption, which is often not reversible, particularly in alcoholics. This is also because alcoholics are generally deficient in folate, thiamine & benfotiamine, and vitamin B12, which can also lead to nerve damage. Some people are born with a mutation while others develop it during their life. Usually, if genetic mutations lead to neuropathy, this becomes evident during childhood. A number of genes have now been identified in causing nerve damage, and particularly the Charcot-Marie-Tooth form of the disorder. As previously stated, neuropathy is incredibly common in people diagnosed with diabetes, either type 1 or type 2. It is believed that the high levels of glucose in the bloodstream can cause damage to the nerves. The longer people have had diabetes, the more likely it will be that they will have nerve damage, and that the condition will become progressively worse as well. Neuropathy is so common in diabetics that their care team should teach them how to inspect their own feet for chilblains, ulcers, and open wounds or sores. Unfortunately, in some cases, amputation may be necessary. As you can see, neuropathy is a complex condition that can have many different causes. Whether or not the condition is permanent will depend on the cause. Often, it simply requires a cessation of medication or exposure to certain pollutants for the condition to begin to reverse itself. At other times, it not only stays permanently, but it also gets progressively worse. It is for this reason that so much work is being done to better understand the risk factors associated with neuropathy. Modern medicine continues to be curative in nature, which means that the focus is reactive rather than preventive. People will not receive treatment until they begin to show symptoms of an illness. Fortunately, there is a discernible shift towards a focus on preventive measures, incorporating diet, nutrition and lifestyle changes. Supplementation with B vitamins, alpha lipoic acid, and other herbs are common treatments used with positive results. One particular supplement Nerve Renew has received a lot of positive feedback from people with different forms of neuropathy. If this can be achieved with neuropathy, then many people will find themselves with a much greater quality of life.